Restoring sight affects more than one life. Ngu. Fearful, helpless, hurting… then a 20-minute operation gave him his sight back and his life. This is a story we see all around the Pacific. A good person, struggling with unnecessary blindness, robbed of their independence and their dignity. How does this story end in smiles and laughter? Unable to work, there were now severe financial difficulties for Ngu’s family. When you look at Ngu today it is hard to imagine this strong, proud Tongan man having to be led by the hand around his own home. But that was the case when Ngu’s cataracts took his sight and took his independence. With his confidence gone and his self-esteem in tatters, these were dark times for Ngu in every sense. Ngu suffered a traumatic eye injury 20 years ago. His eyesight deteriorated so significantly he had to say goodbye to working on his farm. As often happens after such injuries, Ngu developed cataracts. Unnecessarily so, as his cataracts could easily be removed. Getting by became a daily struggle. Unable to work, there were now severe financial difficulties for Ngu’s family. His wife had to work far longer hours than before to keep food on the table. In her absence, his young daughter shouldered the burden of looking after her father. This meant she had to curtail school, she didn't have time to play sports, play with her with friends or enjoy the freedom of childhood. Little wonder Ngu became depressed. You may be wondering how things came to be so bad. Surely Ngu’s deteriorating eyes could have been treated earlier? Unfortunately, living in Tonga, Ngu does not have the same access to eye care as we do in New Zealand. So many blind people in the Pacific can be treated, but there are no eye doctors to treat them. But everything changed the day The Fred Hollows outreach team came to Tonga. When Ngu came to the clinic, he needed his daughter to guide him to his seat, then lead him to the theatre. Ngu was nervous and fearful. Twenty minutes after he entered the theatre Ngu’s sight had been restored. Not that he knew it. The eyes needed to be bandaged for a day, to prevent infection. Tears of relief streamed down Ngu's face. The next day his prayers were answered. When the bandages came off, Ngu was almost dumbstruck. Looking to the sky he raised his arms. “Praise be to God", he whooped with delight. He was thrilled he could see his wife and daughter again. Before his sight was lost he worked hard to provide a good life for his family. His wife worked and his daughter went to school. Over time, his sight deteriorated. He stopped working. His wife worked longer hours and his daughter curtailed school to care for her father. The money simply didn’t stretch far enough. They moved from their home and away from his community. The Fred Hollows Foundation’s Pacific outreach team visited his country. They performed a sight-restoring operation. A day after his operation, the man returned to have his bandage removed. He opened his eyes and light came streaming in. He could see the faces of his family again. He returned to work, independent and proud once more. Able to provide for his family, pay his bills and contribute to his community again. His daughter was able to return to full-time schooling and now dreams of becoming an eye doctor to help people like her father. ​The greater impact of blindness in the Pacific. Blindness is far more prevalent and it has far greater impact on society in developing nations than here in New Zealand. In the small island nations of the Pacific, the burden of care falls on extended family and friends. You will see villages where many of the elderly are suffering from eye disease of some kind. There is no assistance from the state to help these poor individuals. The villages are left to do what they can. One thing often overlooked is the economic impact, particularly when the blind person is of working age. 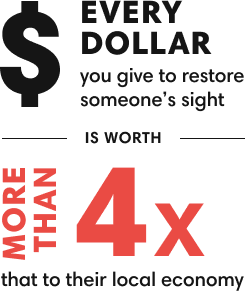 In all, every dollar you give to restore someone’s sight is worth more than four times that amount to their local economy. It gives many individuals the chance to return to work and with that comes enormous personal and social benefits. For people like Ngu and thousands of others in the Pacific, the restoration of sight has been a true gift of a better life for them, their families and their people.